2 x 1m (A Pair) QED RUBY ANNIVERSARY EVOLUTION Audio Speaker Cables Terminated with 8x (Universal Fit 4mm) QED AIRLOC Metal Forte Banana Plugs of Both ends. The RUBY cable listed is a Pair length of Speakers. QED’s celebration at 40 years of being the pioneers in audio and connectivity has extended itself to the Ruby Anniversary Evolution speaker cable, an improved tweaking of the excellent Ruby Anniversary cable. In this recent upgrade, the Aircore™ technology utilised on the Audio40 analogue interconnects has been carried over in a new miniature format. Ruby Anniversary Evolution has a fairly conventional figure of eight form on the outside but within this clear polyethylene outer ten 99.999% OFC conductor cores wrap around an inner hollow core. Using this design “skin effect” is reduced which results in a wider frequency range using more of the available conductor. The individual copper strands are visible through the jacket, giving this cable its unique look. Ruby Anniversary combines high-end cable technologies with a reasonable price point which makes it ideal for mid to high end hi-fi and home theatre applications. 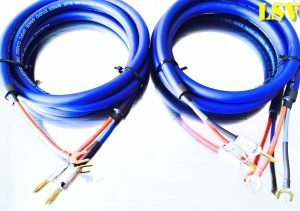 We highly recommend this cable as a step up from regular copper or budget wires.